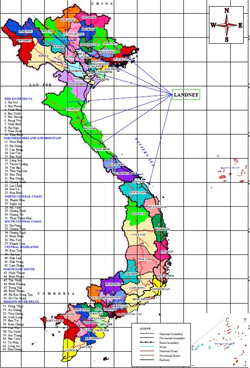 Until 2018, LandNet has project sites in 7 provinces, including Lao Cai, Son La, Lang Son, Nghe An, Ha Tinh, Quang Binh and Kon Tum. Currently LandNet had 146 active members, of whom 32 are women. Most of LandNet members belong to ethnic minority groups: Thai, H’Mong, Nung, Tay, Dao, Ma Lien, Ro Ngao, Ja Rai and Kinh. All of the members participate in LandNet activties willingly, in the hope of self-improving and sharing experiences on effective forest land use and management with each other. Since establishment in 2013, in collaboration with LandNet Secretariate, local authorities, experts, organizations of LISO (CIRUM/CODE/SPERI) and other organizations, LandNet has organized and implemented programs/activities in action research and developing forest land protection and management models, in both household and community levels. The results of these activties are evidences to be used for sharing among LandNet members, in particcular for lobby/advocacy, e.g., to contribute to the Forestry Law Revision 2004 in the coming years. Details on evidence models in all project sites are as follows. 1. Sustainable forest land protection, development and management model implemented by Ms. Vi Thị Hòa and Mr. Ha Van Chau in Khe Vap Village, Bac Lang Commune, Dinh Lap District, Lang Son Province. 2. Agroforestry farming model by Mr. Tran Trong Binh in Son Kim 1 Commune, Huong Son District, Ha Tinh Province. 3. Natural Forest protection, development and management model by the household of Ms. Tran Thi Dao and Mr.Tran Ngoc Lam in Son Kim 1 Commune, Huong Son District, Ha Tinh Province. 4. Local forestry nursery model by Mr. Nguyen Tien Ho in Khe 5 Village, Son Kim 1 Comune, Huong Son District, Ha Tinh Province. 5. Forest enrichment and recovery by local forestry plants model by the family of Ms. Le Thi Nguyet and Mr. Huu Van Nhang in Ho Muoi Village, Minh Son Commune, Huu Lung District, Lang Son Province. 12. Customary law based Community forest management implemented by Ro Ngao people in Ho Moong Commune, Sa Thay District, Kon Tum Province.